From a young age, Patricia Sjulson knew she wanted to start her own business someday. Fast forward to August of 2016, the boutique she worked at was giving her fewer and fewer hours, and she decided it was time to take the plunge. A year later Winnie Lu opened its doors! Working in retail can be a whirlwind, but Patricia’s goal is for Winnie Lu to be a refuge of joy and positivity for her customers. Read on to hear her open up about navigating personal struggles, listening to your gut, and valuing connection over work at home. Tell is about Winnie Lu. 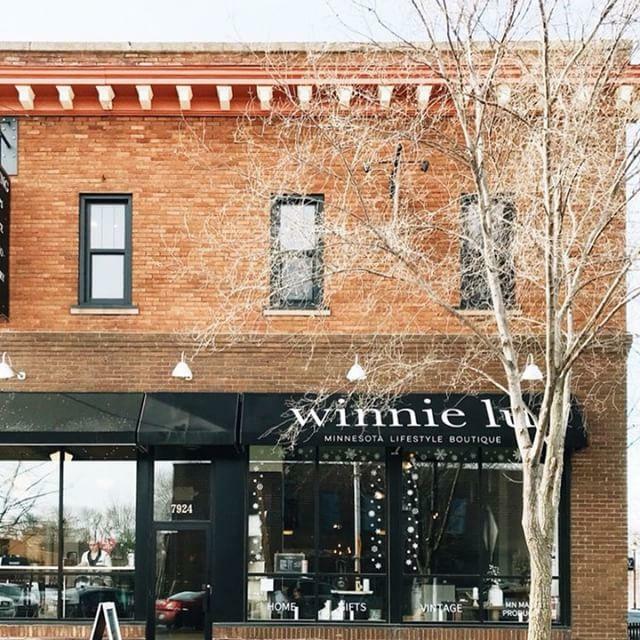 Winnie Lu is a lifestyle boutique that specializes in Minnesota made products. It has a rustic farmhouse aesthetic that fits in perfectly with that up north feel we all love here in Minnesota. I have customers of every age and every walk of life, and I LOVE getting to know everyone! Don’t be surprised if we start chatting and you don’t get to shopping until 10 minutes later! Aside from A LOT of babysitting, my first job was as a front desk clerk for a small motel in my hometown of Muscatine, Iowa. I just loved the idea of being behind the desk chatting with everyone and helping them have a wonderful stay. The motel was, well let’s just say not the nicest place in the world…it ended up being a pretty terrible summer job. Thank goodness I got to leave and go back to school! But the one thing I learned was “the customer is always right”, and you should go above and beyond to make them happy. Things would go wrong on a daily basis, and the owner would be out of town four days a week leaving me in charge. With a lot of patience and determination, I got through that summer and became the favorite front desk worker with all of our guests (many of them business travelers that stayed every week). They knew I was there for them and would do my best to accommodate anything that they needed. It’s something I strive to do every day at Winnie Lu as well. The customer always comes first! Well, sometimes sweet little Winnie gets more attention, but how can you say no to that face?! Tell us about your career path before starting your own company. Well, my career path has had quite a few twists and turns, but it has always had one thing in common: people. As I mentioned above, my first official job was as a front desk clerk my freshman year of college. When my senior year came around, I decided I wanted to pursue a career in the museum field, so I took an internship at Iowa State University Museums. It was an amazing experience! In the end, I decided the museum world wasn’t for me. But I still carry a lot of the things I learned from that experience with me to this day. Upon graduating from Iowa State University, I entered the retail world. To be honest, it was never something I thought I wanted to do. But, hey, I was a new graduate and I needed a job! I ended up working for Express as an assistant manager for about nine months, then got married, moved to Minnesota and transferred to another Express in the area. My time there didn’t last long. Fast forward two years, and I became an E-commerce Website and Social Media Manager for a local women’s clothing boutique. Talk about another fantastic job! And probably the one that most prepared me for owning my business. From that point on, my mind was set on opening my own shop. 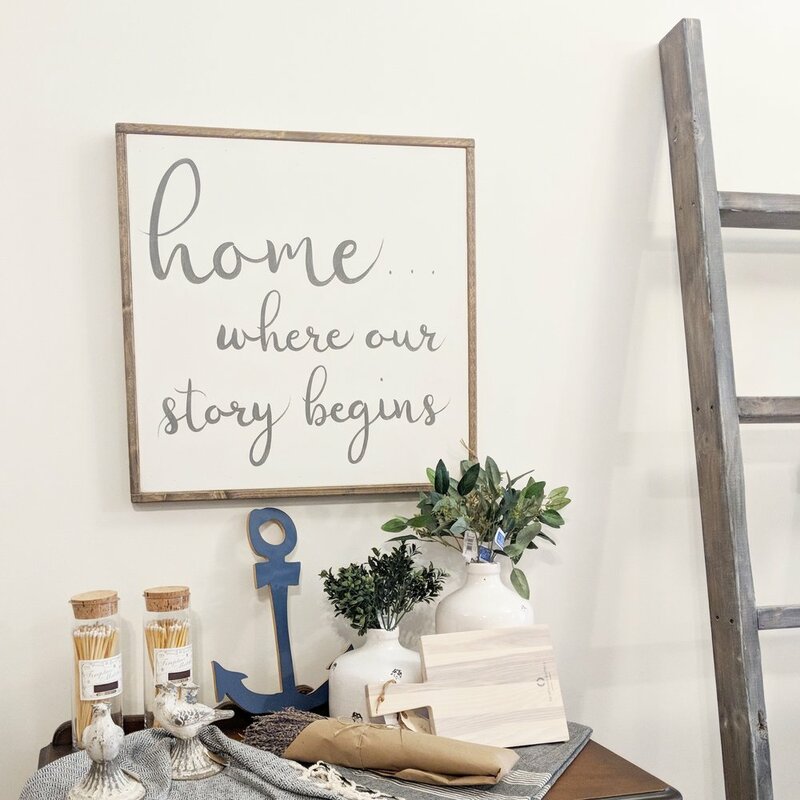 On one hand, I saw things that drove me crazy about the store that I wanted to do differently at my own place – and on the other hand, I got to witness all of the things that worked for their business. In August of 2016, my position was getting fewer and fewer hours, and I knew it was time to open my own store. I officially left my job and spent the next year making a business plan and forming Winnie Lu. Tell us the story of why and how you started your business. From the time I was a little girl, I knew I wanted to start my own business someday. I always struggled to decide what I wanted to do specifically, but the idea of creating something that was all my own appealed to me. I feel so fortunate I had the opportunity to leave my job in 2016 and focus all of my time on opening Winnie Lu. I spent hours researching everything there was to know about owning a business, forming a plan, finances, etc. Right away I wanted Winnie Lu to be different than anywhere else I had ever shopped. The one thing that was important to me was that my shop be sort of a refuge for people. Come in after a long day at work, get a few kisses from Winnie the shop dog, and focus on yourself and your happiness for a short time. “Choose Joy” is a common theme throughout the store on many products, and that’s the mantra of Winnie Lu. I want to create a business that’s about more than just buying products. I want people to see my shop as a place of joy and positivity. I knew I wanted to have a home décor shop. I was burnt out from the women’s clothing world, and I needed to create something I was genuinely passionate about. Every product, decision, social media post, etc. is chosen by me. I love that I can connect with people in so many different ways. My typical day starts around 6:30 am when my husband gets up for work. I‘m in charge of the dog and cat in the morning, so I feed, water, and then take Winnie outside. Once it gets nice out, this is also the time of day when I take a run/walk to exercise Winnie. Then it’s breakfast, get ready for the day, and head to the store around 8:30 am to open at 9. There’s no schedule after that. With retail, every single day is unique, which is so much fun! Sometimes I spend all day unpacking new products and updating inventory on my computer. Other days, I’m kept busy helping customers and keeping the store straightened. Once I close the store, every night tends to be different too. Sometimes my husband and I like to get out of the house and go out for a date night. Other nights, all I want to do is go home, eat a quick dinner, and go straight to bed! Being a business owner can be downright exhausting! We also spend a lot of our evenings feeding our addiction to Netflix shows and college basketball. Tell us about a hard time in your life, career or personal. Although it’s not something I talk about often, depression and anxiety have been personal struggles I’ve dealt with for awhile. I think it’s vital to be open about mental health issues and educate those around you about symptoms, ways to cope, and just general aspects of life. I’ve had to do a lot of soul-searching and personal development over the years to get to where I am right now, and I’ll be honest, it’s not easy! I’m a perfectionist and control freak about certain things, so my anxiety is something I have to be aware of constantly. To come out the other side and live a positive lifestyle and own my own business has been such a blessing! I want to show others that no matter what you’re dealing with on the inside, you can still do anything you set your mind on. Trust me; there have been so many times I never thought I’d get where I am! But with the help of my loving and supportive husband, my trusty sidekick Winnie, and a lot of determination – here I am! My most important piece of advice for new business owners is to follow your gut and not let other people affect your decisions. You know your brand and vision better than anyone else out there, don’t let others get into your head. I’ve definitely struggled when I’ve leaned too much on other people’s opinions and chatter. But every single time I go back to listening to my heart, and focusing on what I know is best for my business, everything falls into place. What’s next for Winnie Lu? -Grow my online presence; website, social media, blog, etc. -Continue to spread joy and positivity in any way I can! I think my ability to connect with people has been the strongest skill that has helped me succeed. I was a shy, nervous child and it’s taken me many years to get to this point. When I started focusing on connecting with the people around me and sharing my heart, that’s when I noticed a difference in both my business and personal life. Outside of my business, my two fur babies and my husband come before anything else! They are my entire life, and I can’t imagine doing all of this without them! Winnie is 1 ½, and Luna is 3 ½, and they are my pride and joy. We spend a lot of time away from work taking walks, playing outside with Winnie, exploring different towns in Minnesota, going to coffee shops, and trying new restaurants. When we’re at home, we love to cozy up in front of the TV and get engrossed in one of our favorite Netflix shows. We’ve also been on a puzzle kick lately. Although that’s a little bit difficult with two animals trying to steal the pieces the entire time! This has been pretty hard for me. Balance is not my strong suit, but as a business owner, I’m learning it’s important to figure out a good routine that works for my family and me. I don’t have kids, so I’m trying to be present in my marriage and personal life. My husband and I try to take 15 or 20 minutes before dinner to sit down and chat about the day and go over any concerns or questions we have for each other. That way we can put aside work after that and just focus on being at home and connecting. We also try to have at least one night a week where we go out for dinner or do something special together. It’s a great way to relax and put aside the stress that’s on my mind 24 hours a day! Oh, and put your phone aside. This one is SO HARD for me, but I’m trying my best to not be on it all evening when I’m home and focus more on my personal needs and relationship. What’s your favorite charity? Corner of Kindness animal rescue. We were foster parents with this rescue, and it’s where we got our sweet little Luna. What age do you want to retire at? Oh gosh, no idea! I just want to be financially comfortable and share Winnie Lu with people for as long as I can! One travel location on your bucket list? Already went there this past fall, but I want to go back to Grand Cayman ASAP! Are you an introvert or extrovert? A little bit of both, but more on the extrovert side. Introvert when I have to talk in front of a large crowd! What is your favorite blog, podcast, or book? My favorite books right now are How Not To Die by Michael Greger and The Magnolia Story by Chip and Joanna Gains. I’m also a huge Harry Potter fan and have read every book at least three times.